As usual normal day-to-day living has got in the way of this update but I’ll try and write a few words on the 4ncl season and see if I can get some photos from Sue. This year I joined the Guildford team and we were looking to challenge Wood Green’s hegemony. 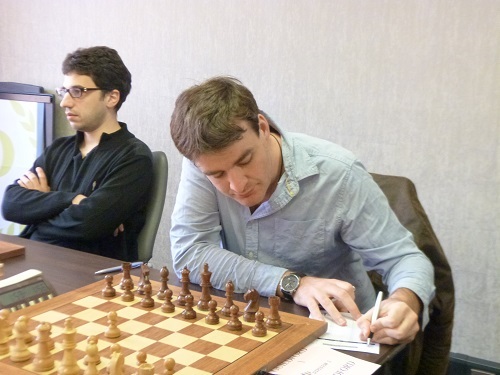 The 4ncl (Four Nations Chess League, although actually only England and Wales have teams) has an odd system which it borrowed from the French league. Basically in the top two divisions both have 16 teams. These 16 are divided into two. These 8 teams play each other in the first 7 rounds. The top 4 go into the Championship/ Promotion Pool and the bottom 4 into the Relegation Pool. So far so straightforward. The teams then play the other 4 teams which they have not yet played in each pool. This creates a total of 11 rounds. However the games from the first pools only count if your opposing team end up in the same pool as you. This creates some strange results as will be seen. The French league encountered various problems and dropped this system but we’re still clinging onto it. IM Richard Palliser and Editor of “Chess”. We were in Pool B where my former team White Rose and Jutes of Kent were likely to be our strongest opponents. In round 1 we played Warwickshire Select, a team likely to end up in the Relegation Pool and thus the result unlikely to count (as long as we won!). Indeed we had few problems and ran away 7-1 victors although I could only draw on top board against the talented Ameet Ghasi. Ameet is the same age as me and was a very strong junior. 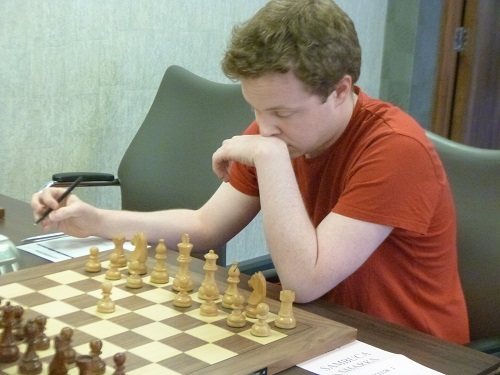 However he then concentrated on his studies and has only recently come back to chess. Already he has managed his IM title and looks likely to become a GM should he continue. Round 2 wasn’t too tough in the end either with another 6.5-1.5 win over the relatively low rated but dangerous Barbican 2 who often manage big upsets. I played another guy I grew up with in the shape of FM Chris Dorrington but managed to win this time. The second weekend started with a potential banana skin against Wood Green 2. The 4ncl rules allow teams some flexibility with board order, with players up to 80 points lower rated allowed to play on the higher board and so second teams can sometimes become much stronger by borrowing first team players. I should mention Wood Green didn’t do this for this match but still we could only manage a 4-4 draw with 6 draws and Nigel Short’s win on top board being countered by Malcolm Pein (the organiser of the London Classic, executive editor of Chess magazine and founder of Chess in Schools and Communities) winning for Wood Green on board 7. I drew against Loz Trent after getting into a lot of trouble when I overestimated my position out of the opening. Round 4 we bounced back quite convincingly with a 6-2 win over a weakened Jutes of Kent team who were missing most of their titled players. I continued winning with White and drawing with Black, this time with a win over Guillaume Camus de Solliers, a French FM who was also born in the late 80s. Rounds 5+6 clashed with the Reykjavik Open but Guildford showed they didn’t need me with a 6.5-1.5 win over Blackthorne Russia and a huge 7-1 win over White Rose. Round 7 was the final round before the teams were broken up into Championship and Demotion Pools. We whitewashed South Wales Dragons 8-0 although the result didn’t actually matter as they were destined for the Demotion Pool. Meanwhile there were a few very relevant matches for us elsewhere. Barbican 2 did us a big favour with a hefty 5.5-2.5 win over the higher rated Wood Green 2, condemning the latter to the Demotion Pool and thus our draw from round 3 disappeared and we were back to 100%! In Pool A Wood Green had been held to a couple of shock 4-4 results, both of which, bizarrely were composed of 8 draws. Like our match with their second team, their 4-4 draw with e2e4 didn’t carry through as they only finished in 6th, but Cheddleton finished in 2nd and so that draw remained. This meant that at the start of the Championship Pool we had a one point advantage over Wood Green 1 and two ahead of Barbican 1, the only 3 teams still with a chance to lift the trophy. Round 8 we played the weakest team to emerge from Pool A, Cambridge University, who had played the system well, beating all the lower teams to ensure they didn’t end up in the Demotion Pool but ending up in the top pool without a single point. I finally won a game with Black, beating FM Dan Bisby who actually achieved an IM norm this season. Our team result wasn’t completely convincing but we pulled out a 5.5-2.5 win. The final weekend is held over the first May Bank Holiday Weekend and so all the important clashes are played together. Round 9 we had to face Barbican 1, the strongest amateur side in the league. I beat Irish IM Sam Collins on board one, a player I know very well and have played many times. Again we had a tight match but wins from Nigel and Matthew Sadler, who we’d managed to enrol for the final weekend, brought us a 5-3 victory. Round 10 should have been difficult but somehow everything ran very easily for us and we whitewashed Cheddleton 8-0. 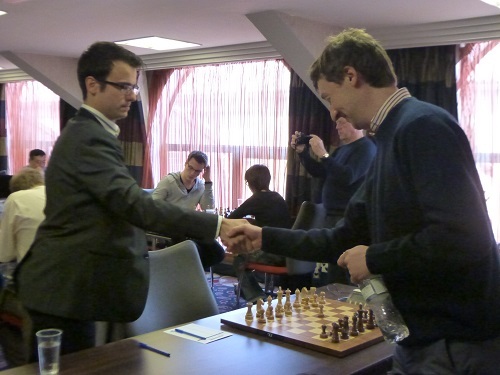 My young opponent, Vladimir Hamitevici, is a very talented player but didn’t really turn up and allowed me a quick victory. Edourd vs McShane. Guildford vs WGHK. France vs England. So onto the final round and the big, anticipated match of the season: Wood Green 1 against Guildford 1. As Wood Green had already dropped a match point earlier in the season we only needed a draw to become champions. Sue already posted the match card up on the site. 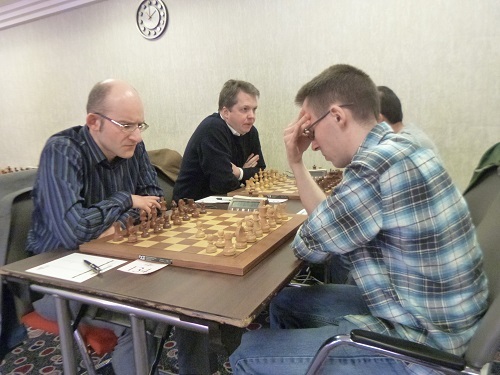 We had Laurent Fressinet, our wildcard who played his first game for us the previous day, Nigel Short, and Matthew Sadler, playing in England for the first time in many years, amongst others. 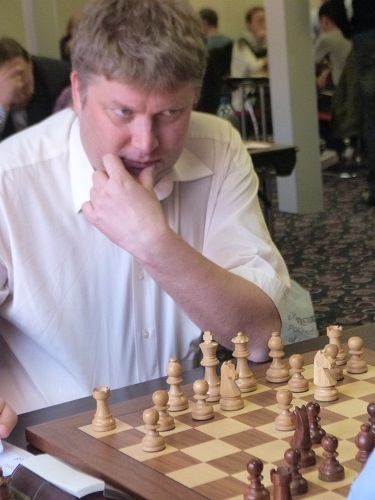 Wood Green, on the other hand, had Vassily Ivanchuk, Mickey Adams, Alexei Shirov and Luke McShane. 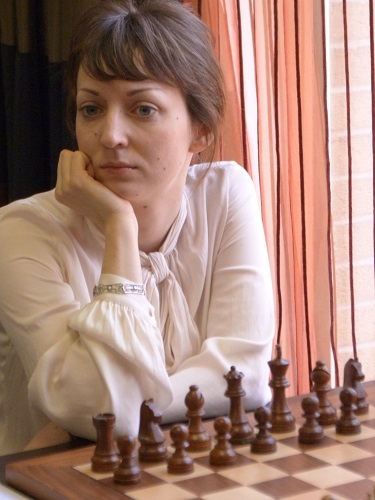 I played Shirov on board one. I’d been told by Roger, our team captain, to play a safe solid game. Instead I ended up sacrificing a piece for an attack but at least it resulted in a quick perpetual. In the post-mortem we thought the sacrifice sound but unfortunately the computer quickly found a hole in it. 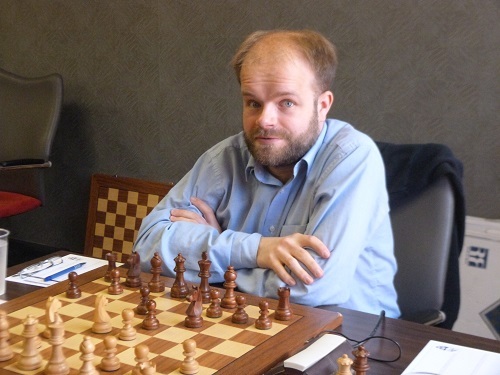 Young Dutch GM Robin van Kampen beat Pia Cramling on board 7 and with only two games left we were leading 3.5-2.5. However Laurent was being ground down by Mickey Adams on board two and Nigel was in a bit of trouble against David Howell. Mickey did indeed manage to convert the point and so the match was left teetering at 3.5-3.5 with Nigel holding a worse Q+R endgame. After biting our nails for an hour or so Nigel eventually held the draw, holding the match 4-4 and so Guildford 1 became 4ncl Division One Champions! 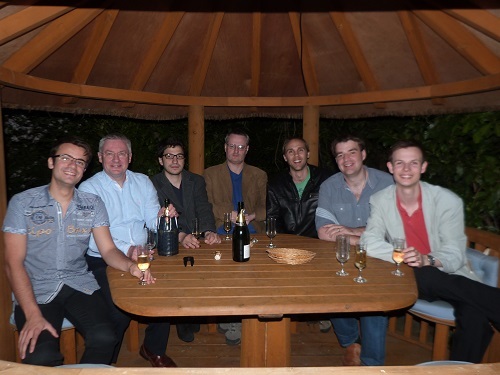 Roger kindly invited us back to his house and we celebrated with a glass of champagne. Many thanks to Roger for his great captaincy and hopefully we can hold onto the title next season. There was a lot of excitement in the Demotion Pool as well, with no teams safe at the start of the final weekend. Ultimately BCM Dragons, South Wales Dragons, Warwickshire Select and Sambuca (formerly Slough) Sharks were relegated. This was a big shame for my former team the Sharks, who were actually in 2nd place in the pool at the start of the final weekend. Our second team survived by some miracle, ensuring we’ll still have two teams in division one next year. Sue had a very good season, scoring 5/9 and gaining 27 rating points. However her team, North East England, were rather outclassed and dropped back to Division 3 North, without scoring a point so Sue’ll have to look for a new club for next season. Final congratulations should go to the players who achieved norms, in particular Bragi Thorfinnson and James Adair who managed GM norms. See you next season!